The Batwa have lived in the area now called Kahuzi-Biega National Park (PNKB) since time immemorial. In 1937, a law was passed creating a nature reserve, but this did not affect the Batwa’s rights. However, a further law was passed in 1970 creating the PNKB, at the proposal of the Congolese Institute for the Conservation of Nature (ICCN). This led to the eviction of some Batwa. In 1975, the PNKB area was then extended from 60,000 to 600,000 hectares. This led to the evictions of more Batwa and limited their rights, without compensation. Non-Batwa have been allowed to remain in the park, or were evicted and compensated. 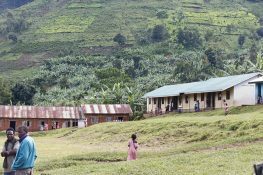 In 2008, with the support of a local organisation Environnement Ressources Naturelles et Développement (‘ERND Institute’), the Batwa launched a case challenging the violation of their rights to property, non-discrimination, and cultural heritage. The case was dismissed in 2008 by the Tribunal de Grande Instance, and then again by the Court of Appeal. A case was lodged before the Supreme Court in 2013, and remains pending. In November 2015, MRG and ERND started a case on behalf of the Batwa before the African Commission on Human and Peoples’ Rights (the ‘African Commission’). The case alleges that the Batwa have been deprived of their land, prevented from practising their traditional livelihoods and denied access to the most basic of social services, suffer a high rate of malnutrition, disease and death and, suffer deep-rooted discrimination while living amongst other majority communities. In making these submissions, the case claims similar violations to those alleged in the Endorois and Ogiek cases, as well as the right to health and the right to education. The Commission was seized of the Complaint in February 2016 and full arguments on admissibility were submitted in April 2016. The case remains pending before the African Commission.